Diego María de la Concepción Juan Nepomuceno Estanislao de la Rivera y Barrientos Acosta y Rodríguez (December 8, 1886 – November 24, 1957) was a prominent Mexican painter born in Guanajuato, Guanajuato, an active communist, and husband of Frida Kahlo (1929–1939 and 1940–1954). 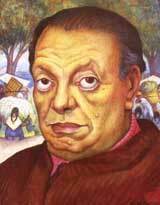 His large wall works in fresco helped establish the Mexican Mural Movement in Mexican art. Between 1922 and 1953, Rivera painted murals among others in Mexico City, Chapingo, Cuernavaca, San Francisco, Detroit, and New York City. In 1931, a retrospective exhibition of his works was held at the Museum of Modern Art in New York City. Rivera began drawing when he was only three, just a year after his twin brother's death. He had been caught drawing on the walls. His parents, rather than punishing him, installed chalkboards and canvas on the walls for the young painter to make use. As an adult, Rivera was a notorious womanizer who had fathered at least one illegitimate child. He married Angelina Beloff in 1911, and she gave birth to a son, Diego (1916–1918). Maria Vorobieff-Stebelska gave birth to a daughter named Marika in 1918 or 1919 when Rivera was married to Angelina (according to House on the Bridge: Ten Turbulent Years with Diego Rivera and Angelina's memoirs called Memorias). He married his second wife, Guadalupe Marín, in June 1922, with whom he had two daughters: Ruth and Guadalupe. 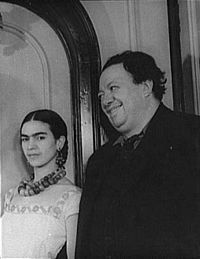 He was still married when he met the art student Frida Kahlo. They married on August 21, 1929 when he was 42 and she was 22. Their mutual infidelities and his violent temper led to divorce in 1939, but they remarried December 8, 1940 in San Francisco. 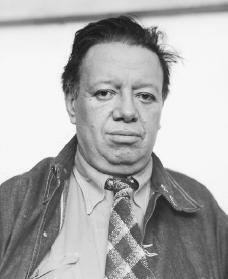 Rivera later married Emma Hurtado, his agent since 1946, on July 29, 1955, one year after Kahlo's death. He died on November 24, 1957.